Have you ever sent an important email, then quickly forgotten about it? Of course you have – it happens to the best of us. But now you don’t have to worry about missing important emails. 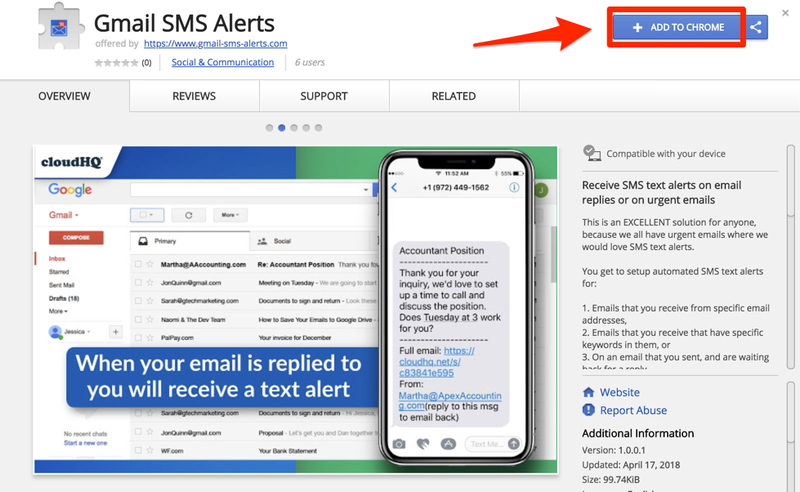 With our new (and free) Gmail SMS Text Alerts extension for Chrome, you’ll automatically be sent an sms text message when recipients reply to your emails. Once you’ve installed your Chrome extension, you should go back to your Gmail account, and on the top right of your screen, you’ll notice a new “SMS” button. Click on that to set up your rules. Follow the on-screen prompts to enter your phone number. Once you enter in your phone number, simply click on the blue button below “Send me confirmation SMS”. You should then receive an automated sms text message with a confirmation code. Enter the confirmation code, then click Confirm. Once you click on your SMS icon to the top right of your Gmail window, you’ll be able to set up new rules. Click on “Add New Rule”. 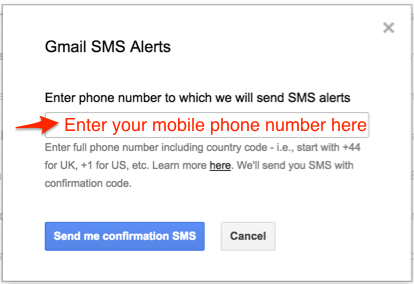 You’ll then get a pop up box that asks you to indicate which email address(es) you would like to receive SMS notifications from. You can also choose which keywords the incoming email’s subject line should include. In this case, we’ll use your boss’ email, and your spouse’s email as the rule for which you should receive any SMS text alerts. Make sure to click on “Save Rule” when you’re done. You’ll now see that your rules are enabled, and your rules will start immediately. You can also get SMS text alerts on “one off” emails. Just open Gmail and click on “Compose”. On the bottom of your email, notice there’s a little icon button that now shows up with an “x” in its talk bubble. You can click on it to enable SMS text alert notifications for any replies on that specific email. What’s also really helpful is that you don’t need to open your Gmail when you get an SMS text notification from our free service. All the information that was received in your Gmail account, will be viewable in your text messages. This is great for when you have limited WiFi and just want to be able to quickly see the information on your mobile phone’s text messages. Venture capitalists who want to know when partners or founders responded to their emails so that they can quickly get in on a really good investment round. Ultimately, this is a great tool for anyone who wants to portray how on-the-ball they are. Share it: You already know that cloudHQ is committed in helping you be more productive in Gmail, but did you also know that we . . .